The good news is that now that you know all of this, you will be able to plan things through the proper way. Even if you keep many of your outdoor belongings in a shed or under a cover, they will still be dirty. Furthermore, some of them may even serve a breeding ground for insects. That is why you need to carefully inspect all of your items and to wipe and clean them thoroughly. 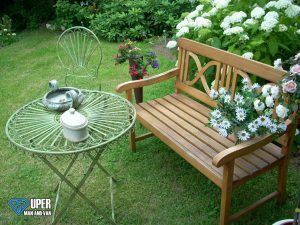 Many of the stuff we keep in our gardens can be easily dismantled, especially when it comes to outdoor furniture such as tables. Make sure you pack all the parts, nuts and bolts together but avoid mixing them because you will have a really hard time assembling your garden furniture later. Since outdoor items are exposed to various temperatures, rain, snow, dust and direct sunlight, they typically do not have a very long lifespan. So, if you find any wobbly chair or if you have a wicker table that is slowly but surely crumbling to pieces, it is best if you do not take it with you. You will spend money on moving something which you will need to replace in a few months anyway. If a lawn mower is part of your outdoor inventory, you must not move it before you drain the gas from its tank. Otherwise, you will expose yourself and the people around you to unnecessary risk. What is more, the movers may refuse to load the mower to the transit van if it has a full tank. Those of you who are fans of Sunday BBQ will probably be happy to learn that they can move their barbeque together with their furniture. However, it is best if the BBQ grills are packed and moved separately. Outdoor items you should never try to handle without professional assistance are playhouses, outdoor hot tubs and other bulky things. They are too heavy and they are also classified as special items which is why it is best to simply leave them to the pros. Count on skilled removal experts if you also need a hand for the packing. All reliable moving companies provide packing solutions, as well as inexpensive delivery of packing materials in London. Do not hesitate to take advantage of these additional options because they will make your relocation more hassle-free.